NannyPaye was first incorporated in May 2001 by Graham Newton who still actively manages the operation now. Many if not all of the NannyPaye clients know Graham very well and any new subscribers will often speak to him during their set up process. The company started (as many do) with humble beginnings operating with a small team from a high street location in Surbiton, Surrey. 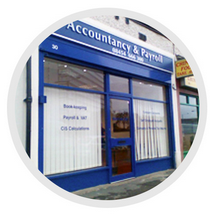 The picture of the blue shop shows our initial shop front offering accountancy and payroll work. 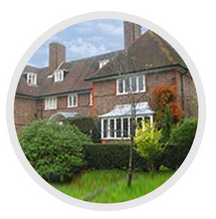 NannyPaye now operates from a converted mansion in Surrey. It’s a lovely location with beautiful gardens and even a windmill in the grounds. In the summer the staff will often have the windows open and the sounds of the birds singing are often commented on by our clients. Don’t be fooled by the tradition exterior though as the building is a hub of business activity with excellent security and IT infrastructure allowing us to support our clients in a professional and secure environment. Clients are welcome to visit to talk through any complex situations but please call in advance so we can arrange a meeting room. NannyPaye is not only a nanny tax company, in addition we work for many businesses across the UK including some multinational organisations and also actively work with the Disclosure and Barring Service (DBS formerly known as the CRB) and have the ability and professionalism to produce DBS checks. We understand that our clients have a choice in who represents them to HMRC for their payroll needs but we hope that this quick summary of our unique selling points will help you decide to choose the comprehensive service of NannyPaye. Professionalism – NannyPaye is a professional and established company that is trusted by thousands of employers right now for their payroll needs. We are also trusted by large multinational companies for their payroll work and have a chartered accountant as part of our team. Service – Our service covers everything that every other company offers plus other unique to NannyPaye items, all backed by our established reputation. Legal Advice – Importantly our legal line is run by a large legal firm that offers legal advice to many other reputable companies such as high street banks. This means the advice is structured, concise and of course correct. Price – We offer great value for money with the most ‘hand-holding’ service on the market, but still for a much lower fee than our main competitor. Your Account Run Your Way – Send us information either over the phone, via the client section on our website or via e-mail. SAGE – NannyPaye uses the reputable SAGE Laser Security Sealed Payslips giving employees high end payslips. This may sound trivial, but many nannies do not feel like employees as they work so closely with you and are often more like a member of the family, having a quality payslip that they receive directly in the post gives them the feeling of being a 'proper' employee. Duplicate Electronic Payslips – NannyPaye is the only company that e-mails you your payslips in addition to sending a paper copy to your employee. E-Filing & RTI – NannyPaye has invested in the latest technology meaning we communicate with HMRC instantly via our SAGE software. This means your employer records are always instantly up to date rather then relying on paper submissions.